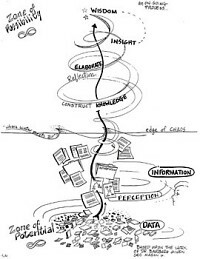 After years of collecting mindmaps from all over the web, I started to wonder who was my favorite hand mind mapper out there: Foreman, Garcia, Kleon, Nast, Petiford, Sicinski, (the order is alphabetical, so that won’t help) … who have I missed? None of these contacted me and said “Hey, my work should be on your site!”, though others often do. Instead they turned up in one place or another as I roamed the websites of people interested in mind and concept mapping. Some time ago I did a series of posts about this, ran a survey, and made a couple of follow-up posts. The work I came across was so interesting, and the people involved were such luminaries in the world of information mapping, that I decided to make edit the posts together into this permanent page. Here’s a snippet of work from each of these mappers and links to their sites for more. What do you think? 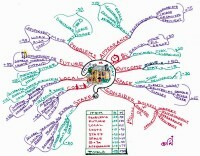 Click here to open Paul Foreman’s mind mapping site but make sure you have a couple of hours to spare. 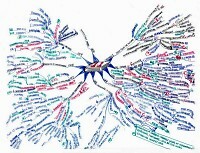 Paul’s mindmaps cover a wide range of contemplative and self-improvement topics. I’ve conversed with him by email and find he is a most modest achiever – far too modest about his own abilities and accomplishments. There is a strong mind mapping influence in the first of Luis Garcia’s work above, where he can be seen as someone forging his own rich and unique style. The second could hardly be called a mind map (no words at all), but it’s such fun I had to include it. I found these interesting examples of Luis’ work on the photostream of that well-known mind mapper Philippe Boukobza, of the Paris-based group “French School of Heuristics” (EFH). Even after some deep searching, could not find a site or blog for Luis himself. Austin Kleon is a writer and cartoonist who is active in the visual-mapping community, with a bubble-diagrams style that’s all his own. 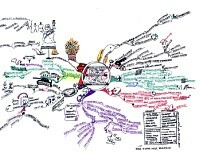 Austin Kleon’s collection of mindmaps is at this link. Jamie Nast, famous for the picture of her waving a handful of colored pens, is a classic hand-drawn mind mapper, who mainly works on paper and spreads her work through international training sessions. It’s a little hard to find examples of her own work, because she’s so generous in promoting on her blog the maps of attendees at her courses, but the above two are her own, I believe. Michael Petiford is a prog drummer, artist, art teacher and music teacher. Oh! and a very inventive mind mapper. 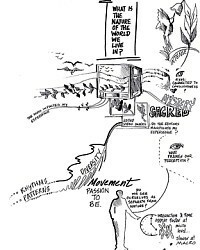 Adam Sicinski has developed a very personal and engaging style of mind mapping that it would not suprise me if even Buzan envies. 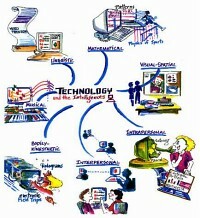 His site of mind maps at IQmatrix is another one where it is easy to spend a lot of time exploring and reading. I wish the artist who drew this had put his or her name to it. Maybe it’s that little squiggle at the bottom left. And I wish that examples of other work by the same person were findable. As neither is the case, I include it as an example of a most creative variation on mind mapping. It came from a site about permaculture which has now gone to the great compost heap in the sky. When I discovered this loss, I did manage to rescue a slightly larger version which is linked to from the image above. When I did the series of posts that now appear as the page you are reading, I ran a survey, and asked that amongst these creative, imaginative and talented people, everyone should pick their favorite. Along with the survey responses, I had comments, direct emails and remarks in the survey questions telling me of other mappers that you thought I should know about. I’ll come back to that below, but first I should give the results of the survey. This was not a survey about “who’s best”, but rather who was your favorite amongst the five. I wasn’t very surprised that more people said that Adam Sicinski was their “absolute favorite” than anyone else, with Austin Kleon a close second and Jamie Nast third. Paul Foreman had very solid support in the “I really like this” and “Pretty good” columns – almost across the board, in fact. But they are all great mind mappers. “New faces” in the title here means “new to the face-off”. 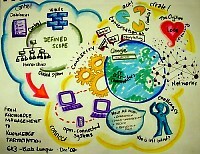 The outstanding hand-drawn mindmappers now added to my earlier list are not new faces on the mind mapping scene. Clicking on any of these images takes you to the original page. Nancy Margulies – her works – she calls them Mindscapes – are wonderful. I omitted her from the original list only because I couldn’t remember how to spell her name and therefore find her site. If you’re not familiar with her work, take a look at her Mindscapes site. And if your artistry and insight is, sadly, anything like mine, weep quietly as you do so. Roberta Buzzacchino – Roberta’s work is in Italian – she works in public administration and has a legal background. Alberto Martinez – is an engineer-turned-manager and an active mapper whose work has the simplicity and clean appearance of good business mapping. Nancy White – Nancy has pages of work on flickr.com. Not all are mind maps. 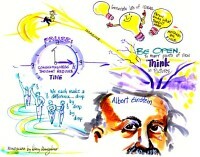 She uses visual communication in her work as a presenter, writer, teacher, coach, facilitator, rapporteur. Debbie Showler – Debbie is an IT consultant and certified Idea Mapping Instructor from Canada. Vanda North – Vanda runs her own company: The Learning Consortium. She was the founder and global director of the Buzan Centres from 1988 to 2006. Lex McKee – I found Lex’s work by chance while searching for example of the work of mindmappers that commenters and survey respondents recommended. He works with Vanda in the Learning Partnership. My thanks to all who filled in the survey, commented and gave me names and links to the work of other mindmappers who produce wonderful hand-drawn work. Finally an addition by one of my favorite mindmappers, Austin Kleon again. It’s titled Mind maps: Pictures and words in space and is an engaging run-through of Austin’s unique uses for mind maps. Hat-tip to Philippe Boukobza for the pointer to this which came after I had run the face-off. I rarely make hand-drawn maps myself. I’m more likely to make spidergrams (what WikIT refers to as common mindmaps) with MindManager or 3D maps with Topicscape and I rarely stick to the Buzan guidelines – I find it just doesn’t work for business maps. But I find great inspiration in the thinking and art-work of these mappers.